A pudding tastes better when it is described as ‘healthy’ than when it is described as ‘diet’. A business proposal is more credible and persuasive when it is delivered by someone with the title ‘director’ than when delivered by the same person but using any other title. And students judge online courses more favourably when they think that it was taught by a man than when they think that a woman taught it. And, according to this paper by Kirk Plangger and colleagues, labels matter for how organisations see (and treat) customers, too. Plangger and colleagues say: ‘a label activates a set of cognitions about a group, which has a profound effect on how members of the organization think about and act toward the group’. The authors go on to say that, for instance, when a hotel refers to its customers as ‘guests’, it suggests that ‘these customers are well liked, always invited’. There is an implied sense of hospitality, warmth and ‘homeliness’ in the word ‘guest’, and that sense shapes the relationship in a way that the labels ‘tourist’ or ‘visitor’ wouldn’t. Likewise, referring to an airline’s customers as ‘world travellers’ conveys a sense of indulgence and discernment that is not present when the same customers are described as ‘economy class passengers’. The former is focused on the experience, the latter on the cost of the flight. The article also argues that labels create a psychological contract between the customer and the organisation, in the sense that it creates certain perceptions and expectations. Disappointment arises when the organisation fails to meet those expectations – for instance, when the label creates a high-service expectation, but the service delivered is not high standard. This observation leads Plangger and colleagues to warn organisations against making ‘a customer name change that is merely window dressing (…) Unless the organization itself has changed, and that as a result of this it will change the way it converses with customers, then the consequences could be grave’. The issue is, of course, that perceptions are rooted in people’s experiences and, as such, they are not uniform. This means that we must understand what the label represents for all parties involved. The following factors can be a source of misalignment of representations. I, for one, will never forget the confusion in a colleague’s face when I kept talking about my ‘chocolate stock’. She thought that I was referring to some obscure investment I had made (as in stock = shares), whereas I was referring to the amount of the delicious stuff that I had in my cupboard (as in stock = inventory). Alas, George Bernard Shaw famously said that ‘England and America are two countries separated by a common language’. For highly entertaining and educational tweets on ins and outs of the English language, check @lynneguist. Loewenstein and Ocasio (2003) provide a good example of how even well accepted labels might represent different things: The word Vice President means something different in a commercial bank, where the title is ubiquitous and the power of the occupant limited, than in most industrial corporations where the term is understood to imply a relatively higher status and rank. 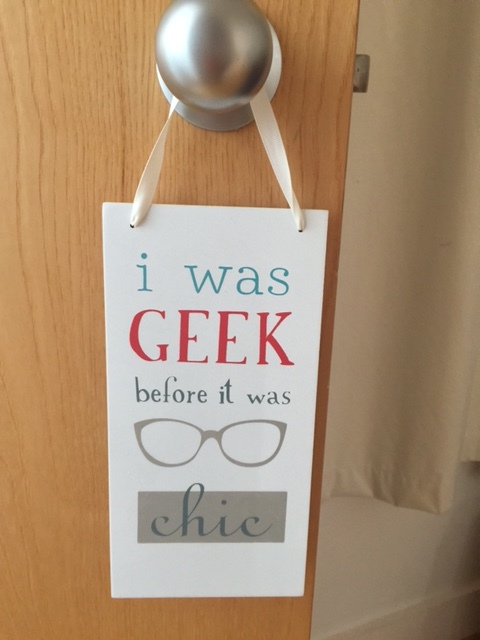 My teenager has a door hanger that reads ‘I was Geek before it was Chick’. She also has a t-shirt with the word ‘geek’ written across the front, which she loves to wear. It is something that I would never have imagined a few years ago, let alone when I, myself, was a teenager. Another label whose meaning has changed dramatically over time is ‘hacker’. It went from being a word that denoted a troublemaker or, even, a criminal, to one full of positive connotations. The label ‘hacker’ is (now) used to describe someone who is very creative, who solves long-running problems in novel ways. Lady Gaga famously referred to her fans as the ‘Little Monsters’. Here, the label was used to identify a group, creating a boundary between those that are inside the group and those that stay outside. But the label will only serve as an identification mechanism in the right context. If Lady Gaga (or another person) uses this label to refer to the group of people that like her music, it is deemed as positive. If I referred to a group of youngsters as ‘little monsters’, however, the label would assume a very different meaning. Alas, words are never ‘just semantics’. Is there a particular label used by an organisation to describe its customers that you really like? Or, on the contrary, that really irks you? Posted on September 4, 2015 September 4, 2015 by anacanhotoPosted in Marketing in everyday lifeTagged Cognition, Customer service, Geek, Kirk Plangger, Labels, meaning, Semantics, Semiotics.